The University of Delaware's main campus is in the city of Newark, centrally located between NYC and Washington D.C., and approximately one hour from Philadelphia. The school boasts a beautiful campus, and the Main Street in Newark possesses its fill of restaurants, coffee shops, bars, and stores. The university is on the larger size, with an enrollment of over 16,000. Delaware offers its students a quintessential college experience combined with a warm small-town community feel. Transportation: Philadelphia International Airport (PHL) is the closest major airport to campus. Located seven (7) miles from downtown Philadelphia, it is a 45-minute drive to the University of Delaware’s Newark campus. Another option is Baltimore-Washington International Airport (BWI), a 75-minute drive from the school. Delaware Express Shuttle Service serves both airports. Limited AMTRAK service on the Northeast Regional line is available from Newark Train Station. A better option is to go in and out of the Wilmington Train Station, a regular stop on several AMTRAK routes, including the Acela Express and Northeast Regional routes. Mascot: The University of Delaware teams may have one of the more unusual nicknames in all of college sports. The name "Fightin' Blue Hens" dates back to the Revolutionary War and has been used by University teams since 1911. A fun fact: UD's College of Agriculture & Natural Resources maintains a breeding group of Blue Hen Chickens on the campus farm. Stay: The Courtyard Marriott, owned by UD is your best option located on campus, with a staff comprised of many University of Delaware students majoring in hospitality. Newly opened and already popular is the Springhill Suites by Marriott. Other good choices include the Sheraton Wilmington South, Homewood Suites Newark, Embassy Suites Newark or the Holiday Inn Express and Suites Elkton, just 4 miles away in Maryland. Coffee: Popular mini-chain Saxby's has a branch right on the university campus opening at 7:30, perfect to wake you up before your tour. Next to the school, right on Main Street, there is an excellent coffee shop called Brew HaHa! Regardless of the weather, you will be sure to see students studying on the outside deck or inside the coffeehouse. Other favorite students go to spots include Brewed Awakenings and Central Perk. Breakfast: Newark Deli and Bagels is everyone's favorite quick breakfast spot, with a convenient location, and known for freshly baked bagels some say even rival NY's tastiest. You'll find delicious Acai bowls at Viva Bowl and Playa Bowls - one professor recommended the Tropical Bowl with granola, pineapple and coconut. Lunch: With everything from salads to burgers to fried chicken or salmon, Grain Craft Bar + Kitchen, a lively gastropub has something on its menu to satisfy everyone in your group. For healthy salads head to Roots Natural Kitchen. Other good options for lunch include Home Grown Cafe, Arena’s, and Catherine Rooney’s Irish Pub. All are conveniently located on Main Street, within walking distance from campus. A plus is each one of these restaurants offers excellent outdoor seating. Casual: Klondike Kate’s is a student favorite for brunch, lunch, or dinner! Kate’s offers a fun atmosphere with a friendly staff--it’s always packed with UD students. (A perfect opportunity to observe UD life) Deer Park is an iconic Newark landmark on the National Register of Historic Places--go here for burgers and salads. Iron Hill Brewery has great beer and even better food (also good for lunch.) We hear the baby back ribs or chili rubbed steak are worth trying. A Step Up: Taverna is an excellent restaurant for refined Italian cooking; students take their parents when they are in town as "your always guaranteed to have good food and excellent service." Be sure to order the coal-fired pizzas, the calamari, and the grilled spicy shrimp. Another well-liked Italian, Caffe Gelato has fans for its pasta and its namesake gelato. Recently opened, Brazilian steakhouse Churrasaria Saudades, have Gaucho chefs roasting the finest cuts of meat over open fire. Sweets: If you have some extra time be sure to drive over to the UDairy Creamery, which is the official ice cream of the University of Delaware. The UDairy Creamery is run by UD students from the College of Agriculture and Natural Resources with the ice cream sourced from the cows on the university's farm. Local Attractions: Before you leave campus take a picture with the Blue Hen by the Laird Campus bridge. Adjacent to campus get your steps in at White Clay Creek State Park or go for a walk in Glasgow Park. 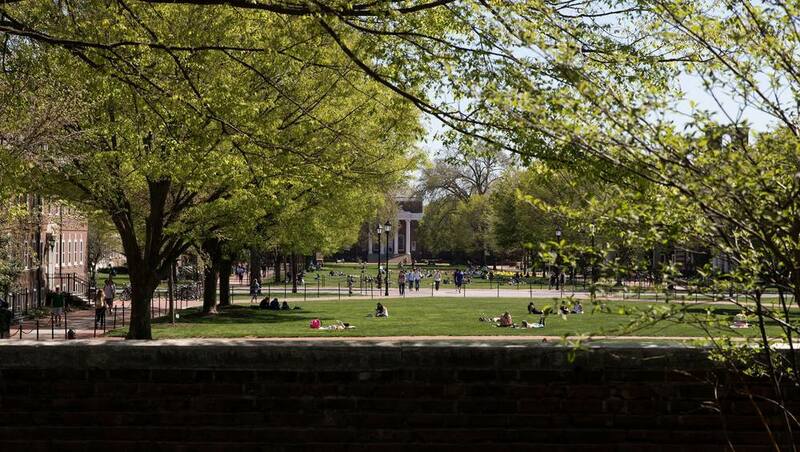 Views From a College Counselor: Stuart Nachbar of Educated Quest remarks on his recent visit to Delaware: “The University of Delaware (UDel) is a fairly large university—with just under 19,000 undergraduates—in the nation’s second-smallest state. Unlike most state universities, the large majority of UDel’s undergraduates—nearly 65 percent—of UDel students come from out of state. The university’s proximity to Interstate 95 also has a lot to do with its popularity. Baltimore, New York, Philadelphia and Washington DC. are all less than two and a half hours from campus. Newark (pronounced ‘New-ark’, accenting the second syllable) is also served by Amtrak trains to those cities.The alumni base while strongest in and around Philadelphia, is sizable in the New York metro area as well as the Baltimore-Washington Corridor. 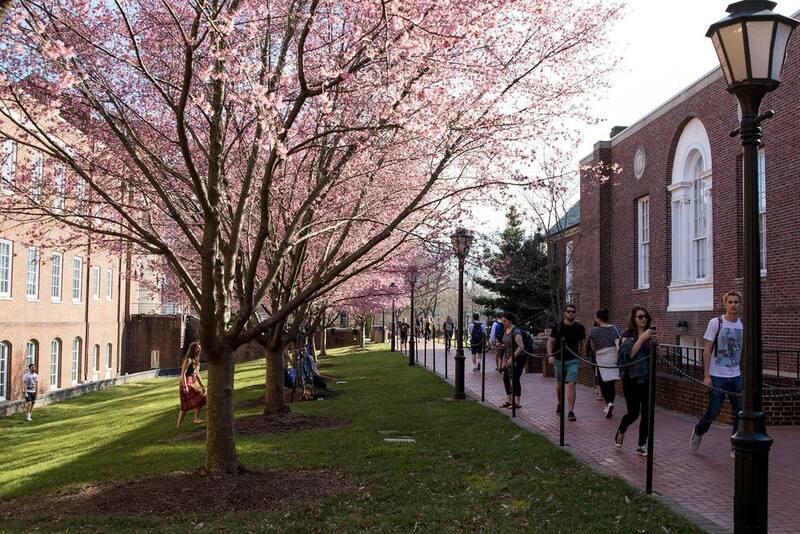 UDel has a less intimidating campus setting than the larger flagship public schools in the neighboring states. The campus itself has a main Green with Colonial style, late 18th/ early 19th century building designs, much like the University of Virginia or the University of North Carolina-Chapel Hill. To see Stuart’s full profile of Delaware click here. Be sure to click on the extended profile link at the bottom of the page to see a comprehensive guide that includes facts on SAT and ACT mid ranges, comparable colleges, curriculum, the alumni network, safety on campus and costs—just to name a few. Just toured the University of Delaware Campus? Are you a University of Delaware student, parent or Alumni? Fill out this 2 minute survey to supplement our Daytripper University Guide for University of Delaware!